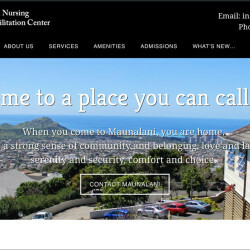 Maunalani Nursing and Rehabilitation Center is one of the top Nursing Centers in Hawaii and has been ranked by the Centers of Medicare and Medicaid Services (CMS) as a 5-Star skilled nursing facility based on ratings in health inspections, nurse staffing, and measures in medical quality of care. But you would not know it by their online presence. In their 64 years of existance at that time, they had never had a website of their own. Their only online search result was a directory website filled with advertisements. Anyone actually making it to that website would believe Maunalani was a cheap, substandard operation. Their competators had professional although dated websites. And these website were generating leads for other Nursing and Rehabilitation Centers. But without their own website, hospitals and doctors had no avenue to refer clients to them. And as Bill Gates said years ago, “If your business isn’t online, you won’t be in business.” Maunalani was hemmoraging leads to their competition simply because they lacked a professional website. A second problem they were facing was with Social Media. Some of the employees had put together a makeshift Facebook page. But with no guidance, people were posting strange things and inappropriate photos on their unofficial Facebook page. Again Maunalani was made to look like a joke. This was obviously not the way to build a business and reputation online. Maunalani decided it was time to change their direction online. But they needed more than just a website. You can hire someone in India to just build a website and I guarantee it will be cheaper than hiring someone local. But hiring an overseas contractor has more horror stories than successes. Maunalani chose us to do more than just a website. They also needed some direction and assistance with their social media presence, and ongoing consulting. Our first step was to design a modern website that could be their base of online operations. We chose a design with bright colors and parallax background image scrolling to emphasize the new direction Maunalani wanted to take with their online presence. We created a beautiful and professional website within their limited budget for the project. 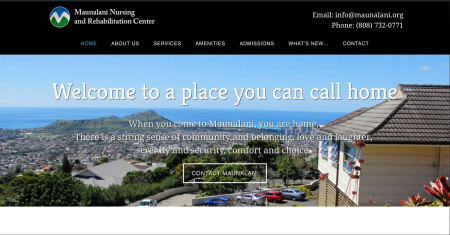 Maunalani now has an online home that they are very proud in. They receive weekly comments on how wonderful the website is and it is only getting better as they develop their website further. Now that they have a professional website, they have done a wonderful job promoting the website. They are now getting hundreds of visitors to their website and they are generating new leads and clients. Last month their traffic went from 321 visitors to 1,021. And this trend continues into this month. Their new website has become the centerpiece of their marketing efforts. Their other problem was with their social media. Now that they have a website, they have opened an Official Facebook page and have begun using it to aid their marketing efforts. They are now building this powerful social media channel that has begun to direct visitors to their business. Although the financial impact of their website and online social media activities has not been calculated. It is safe to say that this project has been hugely successful in generating new leads and building the morale of the staff at Maunalani. HawaiiWP.com has not left them alone in this process. We believe in building long term relationships with our clients. Most of our clients keep us on retainer and we have been pleased to offer monthly training, content marketing, and assistance with their social media efforts.